Summer is well underway, but what about your tan? If you’re still lily white, never fear! There’s a quick and easy way to jump-start your tan without having to lay out or hit the tanning bed. Fake Bake Flawless Self-Tanner can help you get a natural golden glow without exposing your skin to ultraviolet energy. Even if you’ve never tried a sunless tanner before, you can get flawlessly golden results with Fake Bake Flawless. The formula is much simpler to use than other types of sunless tanners. The product comes with a spray bottle top, so you can easily apply it from head to toe. A professional applicator mitt designed specifically for the Fake Bake Flawless formula is included with the product, making it easy to smooth on the self-tanner without any risk for missed spots or streaks. 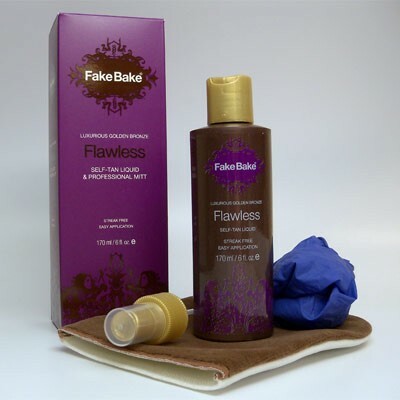 The Fake Bake Flawless Self-Tanner contains an advanced formula created by the sunless tanning experts at Fake Bake. To darken the skin to perfection, the formula uses a blend of DHA, Erythulose and DMI. These ingredients cause the skin to darken as naturally as possible, so the color produced is golden and rich, never orange or brassy. Formulated to dry as quickly as possible, Fake Bake Flawless is the simpler, faster way to sunless tan at home. No matter what your skin type, you can use Fake Bake Flawless without fear of irritation. The self-tanner is free of parabens and artificial preservatives to make it as gentle on the skin as possible. Its delectable tropical fragrance will enliven your senses and put you in the mood for summer fun. It’s not too late to get a tan as hot as the sultry summer weather. You can purchase Fake Bake Flawless Self-Tanner for a great discounted price at TanForLess and get on your way to gold perfection.